This series of twenty sculptures explores the myths and themes of an enduring poem of immense heart and endearing complexity, Homer’s Odyssey. The sculptures themselves are not meant as architectural renderings of structures from antiquity. Rather the boats, the buildings, the monsters, the pounding waves -- all are impressionistic, not meant to represent actual archeological finds. They are features of imaginal landscapes, iconic, emotive, socio-spiritual "geographies." They are Islands of Experience, from my own personal readings of Homer's Odyssey. They also reflect the interplay of this ancient text with modern experience. I am grateful to Richard Brummett and Terry Bourk for taking these photographs of my work. A voice from the past, this story, thousands of years old, remains a foundational text for western culture. Most of us who read Homer in school recall only part of the story – the challenges of the warrior-hero Odysseus during his ten-year journey home from the Trojan War, after the prior ten-year battle over a stolen Greek bride (Helen), between the Greeks and the allies of Troy, which lies northeast of Greece in Asia Minor, in the country we now call Turkey. We remember most the episodes in Books 9-12 of the 24 books comprising Homer's Odyssey. Many of us are familiar with stories of the one-eyed Cyclops and the seductive Sirens, magical Circe and "the pigs," Calypso and the building of the raft, and the exhausted swimmer Odysseus when the raft breaks up – and when having lost all his twelve ships, all his 600 men, all the booty of war, disoriented and alone at sea, left only with a sea nymph's veil, the longing for home, and barely enough energy to veer toward a sudden beach, to haul his naked, sea-shriveled body up from days at sea, to some unknown place, where he covers himself with leaves, like the earth in autumn, and falls asleep. The part of the story that most of us remember is the part that the suppliant Odysseus tells his gracious hosts after he wakes in that sheltered nest, in the land of Scheria, on his last exhausted stop on the way home from the war.We recall the happy shrieks of young girls playing ball as their fresh-washed laundry dries on the nearby rocks rouse him and one of the girls, the princess Nausicaa, the daughter of the king and queen, invites him to seek out the palace in the nearby town of the Phaeacians, who in response to Odysseus telling his part of the story will agree to take the old warrior home. It is they who deposit Odysseus, fast asleep, surrounded by their gifts to him, in a cave in an unfamiliar part of his home island, Ithaca, where he is protected by a fog woven by Athena, the Greek goddess who has guided him throughout his long journey (a scene depicted in Sculpture 15 of this series). Yet for me, the continuing wonder of this ancient text is that the blind poet, so skilled at telling stories within stories, also shares the larger story. Not only does Homer draw on the metaphors of the hero, the one who ventures, the peregrine pilgrim who breaks through the mirror between mortal and immortal. He also includes the stories of those so often left behind, undervalued and forgotten in the hero tale, not only of those lost along the way, but of the families, those who endure on behalf of, those who abide, with all the challenges that abiding poses for those waiting and worried at home. In the words of another blind poet, Milton, "They also serve who only stand and wait." If you decide to read Homer's Odyssey for yourself, I have compiled some background information that you might find helpful. As told by its omniscient narrator Homer, the Odyssey pendulates from start to finish between the trying travels of Odysseus and the travails of his far-distant family and estate staff, effectively abandoned during the twenty-year absence of Odysseus, husband, father, king. Not that his life meanwhile has been a piece of cake – not all a modern high-techer's first-class seating and wine-stewards a push-button away, no, not by any means, but Homer does not let us forget that others have struggled too: Laertes, the old father, his shield in the closet rotting while he retreats to the old orchard out back; Anticleia, the mourning mother, whom Odysseus encounters only in the underworld, as she has died of grief in his long absence; his son, Telemachus, on the verge of manhood, lacking a father's guidance for most if not all of his childhood; the old nurse, the tenant herders, the household poet/singer of tales, other trusty counsel, and Penelope, his faithful wife, her household increasingly under siege by a wolf-pack of suitors who are betting that her husband is long-dead and that as a consequence, the widow and the estate (if they can kill the son) are up for grabs. Homer's Odyssey has been my turn-to book for much of my life. Given a copy by one of my brothers when I returned very ill from a student service project in rural Mexico in my junior year of college, I had no idea how formative the book would become for me, leading more deeply into myth, resulting in my studying the Homeric text in the original ancient Greek. The story has comforted me through many years of my own husband's absence, working "on the bleeding edge" of wireless technology – that unrelenting modern "war" that holds many families hostage, apart from one another and from their earlier roots. In the past decade this work has inspired my revival after a wolf-pack experience of a different sort drove me from my own home in San Diego, resulting in my relocation to Whidbey Island. These sculptures were a total surprise to me. I did not intend to create this series. Rather ten years ago, I was entranced by an inviting form on a small slab of rough wood retrieved from some trees felled in our San Diego neighborhood. I sanded the thin cutting-board-sized slab and began to shape it. With finer sanding, it seemed to me to reveal the trace of a goddess, the outlines of her face and curls barely visible and her bodice-lace a v-shaped splash, like the figurehead on the prow of an old ship cutting through the waves… and a knotted burl heart below that…and when I sliced along one edge of the slab, it intimated the wedge of the bow of a ship. And the ship needed a sea beneath it, which I created from yarn, then a base to sit on, which I created from another evocative slab, and then it all called for a monster with several heads, and some burly rocks for the ship to pass through… only then did I start to recognize what I had become caught up in. Thus began this series, though the piece, sculpture # 9, which appears in the image above on this page, finds its place much further along in the series. Once I had realized that I had entered a Homeric scene, I returned to the text, and was moved then to add Charybdis, the swallowing whirlpool, and the olive tree that Odysseus catches on to on his second time past this challenging guardian at the gate, and…. 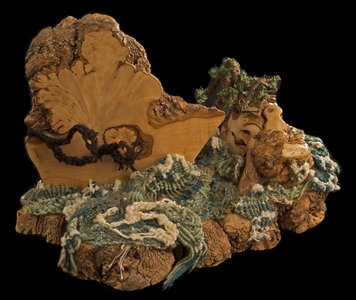 And so emerged the sculpture now called Scylla, Charybdis and the Clashing Rocks --- an "island of experience" from Homer's Odyssey, Book 10. Gradually other sculptures began to take form, Calypso's cave, then Circe's Palace, then the Fog, then the beginnings of the Homecoming, or at least the bed chamber of Telemachus, then the bed of Odysseus and Penelope, from a severed branch of the olive tree on our own property in San Diego --- at which point I thought I was finished – but the text was not yet finished with me. One scene led to another and one sculpture evoked another, etc., a process that has continued intermittently over the past decade. Read a review of a recent exhibit of the Odyssey series. Explore each of the Islands of Experience of Homer's Odyssey individually by means of the navigation bar, above, left. Nineteen sculptures follow. The twentieth sculpture is still in progress. It is currently envisioned as the "final" sculpture. It will be the oar Odysseus takes on a journey he learns in the underworld he must undertake on his return home, a journey which Poseidon, the seagod requires in expiation. Odysseus must carry the oar inland to a place where people do not know of the sea. When someone greets him and mistakes his oar for a winnowing fan, Odysseus must tell the strangers the story of his own adventures, of Poseidon's part in the adventure, and of the sea that carried him home. What changes, one might wonder, in our travels and travails toward becoming fully human? Homer's Odyssey speaks to that question, as if three thousand years ago were just yesterday, in this story of a war from the twelfth century BCE. According to scholars, Homer (and the Homeridae, the traditionally trained followers of Homer) who told the story, began telling it around the eighth century BCE. Even in this ancient tale we can observe the opposite gyres of the masculine and feminine spiraling together, so that through this old story, we see both the masculine and the feminine challenges in the journey of life, through eyes opened and eyes closed, through the regrets of one who fell asleep at the rudder and lost all sight of home, and the sleeping eyes of Penelope, in the two sculptures of her worried dreams, while she awaits his return. I invite you to enter this story through the sculptures. Read along in Homer's Odyssey for all its richness. Explore from your own point of view not only the imaginal landscapes emerging from this wonderful story, but also, if you feel moved or inclined, consider your own challenges, opportunities, losses, and enduring relationships. Visit your own imaginary spaces and projections, the realms of your own trials, your own personal sacred, and your own gender-balancing act. Tend the deeper tissues and issues of millennia-long gender wounding, and the challenges of an emerging sensibility toward gender reciprocity both within and between men and women all over the globe. In truth, it was only as text worked me, and my hands began, almost inadvertently, to translate the iconography of the story into wood and fiber sculptures, that I began to recognize the profound effect of the Feminine throughout this poem. That discovery has fostered my own growing consciousness of the Sacred Feminine and its interplay with the Developing Masculine. Some of the sculptures reflect these discoveries. As the sculptures evolved, further details presented themselves for exploration: the intimate spaces, like caves and bedrooms that have emerged within this series, for instance, and the ongoing dialogue of my creative imagination iwth the Homeric text. As I develop this website further, I will add more detailed photos and accompanying description on the relation between myth and the creative imagination. Stay tuned!